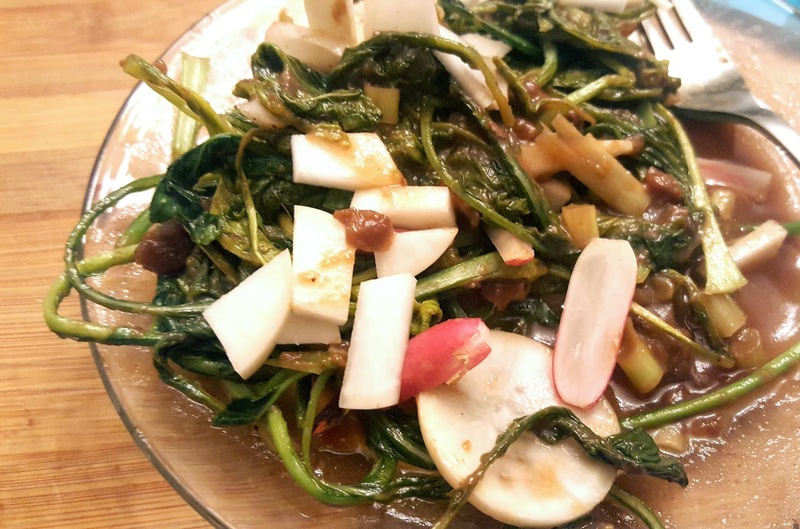 Don’t throw away your turnip and radish greens! A quick sauté in some Tamarind paste will deliver a powerful unrefined and unprocessed source of sweet and sour. This delectable little fruit paste is going to cram a ton of flavor into these spicy and sharp greens, AND with very little effort on your part– what could be better? And thanks to Karma Farms, you’ll have tons and tons of these in your fridge! Head on over to your local Asian or Indian market, and grab a pack of Tamarind paste, and you can keep it in a zip-top bag in your fridge basically forever after (we are one year and counting with our last block). The cooking purists of the bunch will tell you to you should take your tamarind paste and liquid (in this case broth) and maybe even your miso paste and blend before heating. That’s not what I do, but don’t let me stop you. I heat the tamarind paste in the oil at the same pace with the garlic. This makes a kind of sweet and garlicky bouillon that’s bubbly and perfectly seasoned when you go to add the broth. So, first heat the oil, then add the tamarind and garlic, let cook <1 minute and then add your broth, and stir or whisk vigorously to assist the tamarind to dissolve. 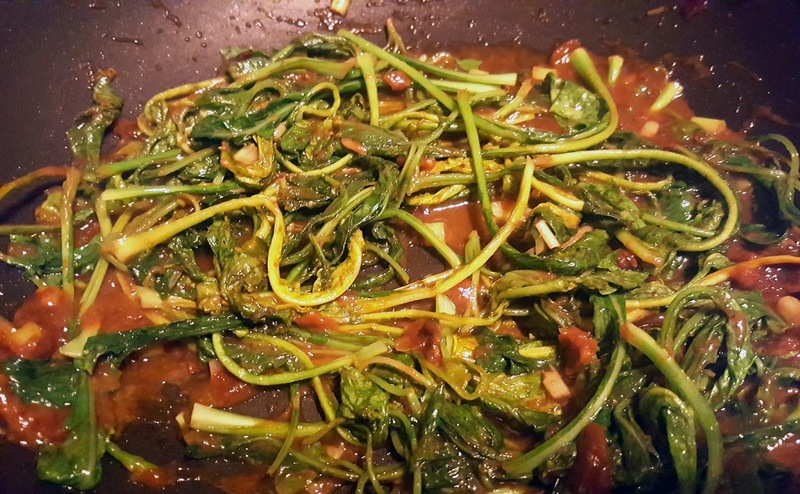 The sauté is pretty standard, except no need to cover, and definitely don’t walk away as these wilt plenty fast. Stir a few time to cover evenly, and these guys will get bright green and droop. Add the miso paste. It will make your life easy to dole out the teaspoon of miso in two parts, and stir throughout. The warm liquid will help the miso incorporate well. Let the pot simmer for 30-45 seconds, and then take off of the heat. Let stand about a minute to let the flavors sink in. Serve with raw radishes and turnips, and don’t forget to scoop out (deglaze , if you will) the pan and drizzle it on top!